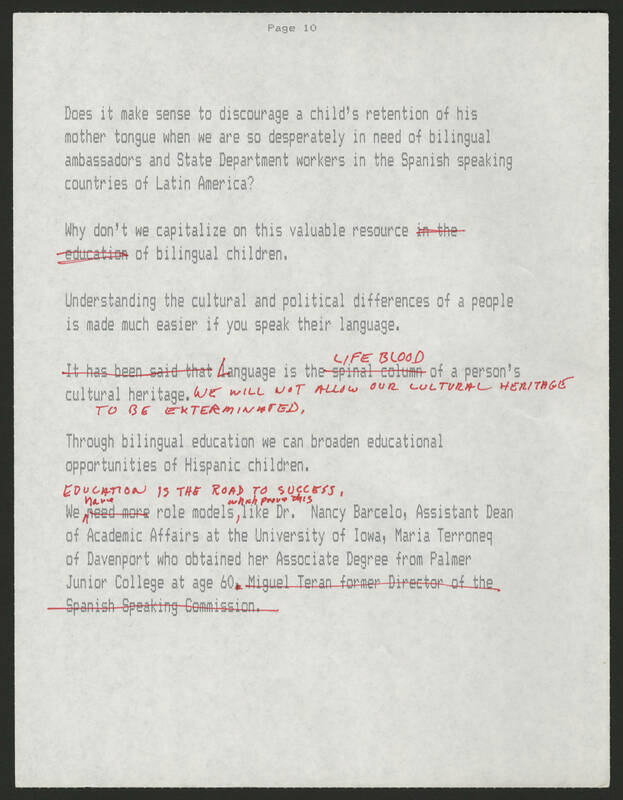 Page 10 Does it make sense to discourage a child's retention of his mother tongue when we are so desperately in need of bilingual ambassadors and State Department workers in Spanish speaking countries of Latin America? Why don't we capitalize on this valuable resource of bilingual children. Understanding the cultural and political differences of a people is made much easier if you speak their language. Language is the life blood of a person's cultural heritage. We will not allow our cultural heritage to be exterminated. Through bilingual education we can broaden educational opportunities of Hispanic children. Education is the road to success, we have role models, which proves this like Dr. Nancy Barcelo, Assistant Dean of Academic Affairs at the University of Iowa, Maria Terroneq of Davenport who obtained her Associate degree from Palmer Junior College at age 60.